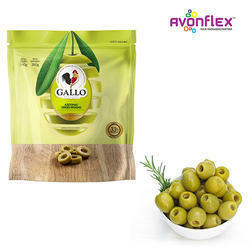 Avonflex has decades of experience in providing a full range of food packaging solutions that complement the way companies do business, whether it’s a small local deli or a large food industry conglomerate, serving customers in the diverse market of dry foods, confectionery, fresh produce and other similar food products. With our wide-ranging flexible packaging product offering, including FFS Roll, Stock Rolls, premade bags and pouches, and more, we have effective packaging solutions for virtually any food product application. 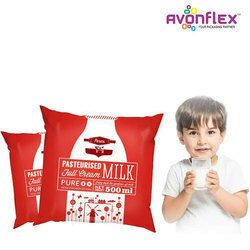 Packaging material offered by Avonflex is manufactured by utilizing superior quality raw materials and latest technologies and they are known for their tear resistance, strength and durability. Our teams have vast expertise in providing the needed barrier performance to protect food products from moisture, oxygen, & odour. We also offer superior printing, ensuring our customers’ food products truly stand out from the competition. Avonflex understands the cost of logistics is a major factor for any industry and this is specifically more applicable for liquid packaging, hence we have mastered the recipe of leak proof liquid packaging to ensure safety of the product packed. To create appropriate liquid packaging, multiple criteria needs to be met and implemented, but the most significant factor Avonflex team considers is offering the optimum protection for the product at the time of transporting, shipping and storing. Liquid packaging should be done in an intricate way keeping complete focus on damage control of the pouches ensuring “zero leakage” perspective without compromising prominent and dynamic packaging design. 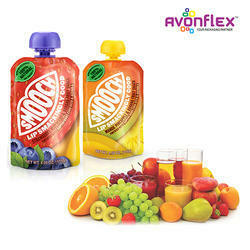 Avonflex offers a versatile collection of juice packaging bags. These bags are made up of multiple layers which protect the product from various hazards. Our pack range includes formats suitable for chilled/extended shelf life products and aseptic/ambient products. We manufacture Juice packing materials which are suitable to meet the specifications of diverse juice manufacturing industries. We supply in Roll form as per FFS Machine Requirement like Multi Track Job Single Track Job. Can be supplied in diverse style of customized Pouch form. Vegetable packaging has to be attractive, easy to handle, durable, safe and compatible for refrigeration as per preservation need of the consumers. It must survive shipping and storage hardship, remain protected from adulteration by oxygen or other harmful environmental factors, remain dry in wet, cold, and icy environments, and have climate resistance closures that stay closed through temperature ups and downs. 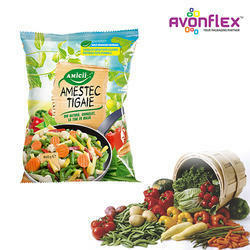 Avonflex offers a versatile collection of vegetable packaging solutions. The packages are made considering the product its shelf life and also the transport modes. Packing materials offered by us are manufactured by utilizing finest quality raw materials and latest technologies and they are known for their tear resistance, moisture resistance, strength and durability. Product intro: The market for water has increased so drastically that the only way to distinguish your brand would be through the use of an effective packaging design. Water is the basic consumable product. It has to be given the best packaging solution and all the materials used should not react with the product. Packing materials offered by Avonflex are manufactured by utilizing finest quality raw materials and latest technologies and they are known for their tear resistance, strength and durability. We use materials that are approved by FDA. Salt is an additive used while cooking and it is also used as a preservative. Salt is available in various forms like powder, crystalline and Solid. Salt is easily tarnished due to different weather conditions so you need to rely on the most effective and high-quality salt packaging solution. 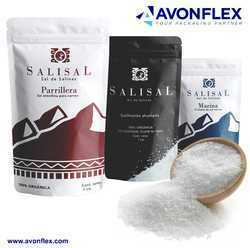 Salt Packaging Material offered by Avonflex protects the packaging contents as they are oxygen and moisture sensitive. The packaging ensures that produce is not spoiled by harmful microorganisms and prevents contamination. Salt packaging can be customized to suit various brand specification. Therefore bags are offered in shiny, gloss or matt finishing. The additional alteration made to salt packaging pouches could include transparent windows to improve customer viewing. Size From 1 Gm. to 10 Kg. Confectionary Products are moisture sensitive products. Water vapour transmission rate of the packaging material used is of importance as it is closely associated with drying, physical structure and protective action against oxidation. These products not only become brittle and hard but also develop oxidative rancidity at packaging Materials. Temperature also plays a very important role. 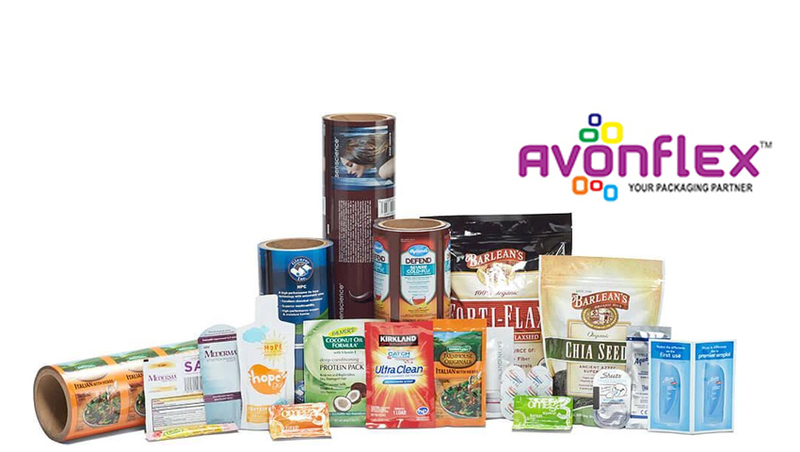 We at Avonflex understand the quality, aesthetic, nutritive and protective requirement of these products and accordingly assist our customers for best packaging in the market. We have proven solutions that have revolutionised this category by presenting confectionery in an innovative way to the shopper. •We supply in Roll form as per FFS Machine Requirement like Multi Track Job Single Track Job. •Can be supplied in diverse style of customized Pouch form. Ice-creams are presented in many different ways and for this reason packaging options are constantly changing and adapting in accordance. As with many other products ice cream packaging must combine strong visual appeal with good product protection. High quality packaging will make your product last longer, sell better, and improve brand recognition. In this situation the design and high quality of the product packaging becomes vital to driving sales and staying ahead of the competition. Avonflex’s printing capabilities make your products jump off the shelf. The consumer only has a split second to either choose your package or pass you by and make another purchasing decision. 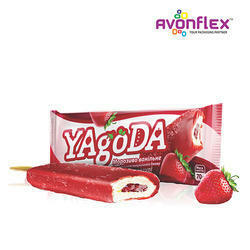 Avonflex offers a versatile collection of ice cream wrappers. Packing materials offered by us are manufactured by utilizing finest quality raw materials and latest technologies and they are known for their tear resistance, moisture resistance, strength and durability. We manufacture Ice cream wrapper materials which are suitable to meet the specifications of diverse Ice cream industries and they are available in varied range of colours, sizes and styles. Ice cream cone outer wrapper. Ice cream candy wrapper packaging. To keep the biscuits crispy, crunchy and tasty for long duration, flawless biscuits packaging plays a pivotal role. Being extremely soft in quality, biscuits need proper packaging, which could protect them from humidity and any kind of damage. 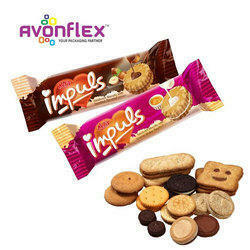 We at Avonflex pay meticulous attention to minutes details, while manufacturing our biscuits packaging material, which provides our clients maximum satisfaction. Our packaging is done in such a manner that retains the freshness and flavor of biscuits for long time. For this purpose, we use raw material of impeccable quality, which is sourced by us from reliable suppliers. It is further laminated to achieve optimum durability. Apart from this, we beautify these biscuit wrappers in contemporary and eye catching designs of alluring colors, which cast a magic spell on the mind of end users immediately. Namkeen Snacks are best served when its properties are maintained till the pack is opened. Snack foods are now ubiquitous all over the world; hence a lot of universal corporations compete to capture the large shares of snack food market. To survive in this throat cut competition as well as improve the safety and appeal of these products, most appropriate snack food packaging is of great importance. We at Avonflex are well versed with this market situation and offer our clients snack food packaging material of uncompromising quality, which strictly adheres as per the requirements and needs of our valued clients. Our hygienically prepared airtight moisture-free packets not only preserve the flavour, freshness and quality of preservatives used in these snacks but also lend the products a visual appeal with snazzy print details. Our snack Namkeen food packaging materials are suitable to meet the specifications of diverse Namkeen industries and they are available in varied range of colours, sizes and styles. Chips Kurkure are best served when the taste of chips is not changed along with its crispy property. Ideal concept of chips Kurkure packaging includes not only attractive print quality and bright colors but also these packets need to be durable and with high barrier quality to keep them moisture protected and air proof. 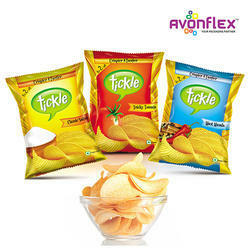 We at Avonflex are offering fine quality Chips Packaging Pouches that comes with air tight sealing and tamper resistance. It has comfortable peeling and come with fine printing option. These are developed from finest raw material and has metalized layer from inside, keeping the chips crispy. The packaging come in several shapes, sizes and color as per the requirements of our clients. Tea & Coffee is best served when its color, aroma and taste are preserved. Therefore preservation of these elements is prerequisite in tea and coffee industries, which can be attained by only premium standard tea and coffee packaging products. 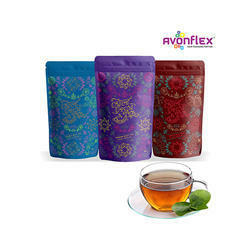 Tea and coffee packaging materials offered by Avonflex have an excellent retention power, which helps in keeping the flavor, color and aroma of tea and coffee intact and provides perfect barriers against dampness, dust particles and other contaminants. Giving these properties importance we at Avonflex provide tea & Coffee bags with Metallic layer or Aluminium Foil as per customer requirement, Resalable Zipper, Clear oval window, and Euro slot. We focus on customer requirements and also try to achieve maximum customer satisfaction. We use superior quality raw materials and latest technologies and they are known for their tear resistance, moisture resistance, strength and durability. Pickle is a spicy item and this property has to be preserved till use of end customer. Pickle also contains flavour and oil. Pickles can retain their flavor, freshness, aroma and color so long, as they do not come into contact with moisture. Hence moisture proof and air tight pickles packaging is essential requirements to keep these items mouth-watering and delicious for a long time span. The pickle films demand a unique combination of food grade material as well as oil resistant. Avonflex develops superior quality pickles packaging materials, which successfully resist moisture, dust and other contaminating items. 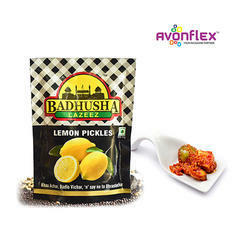 We are engaged in developing fine grade Pickles Packaging Pouches that are made from genuine plastic material. These packaging are available in transparent, semi-transparent and colored packaging. We use tamper proof, lighter in weight and plastic protected from contamination. The Packing offers supreme printing option and makes it attractive. Spices can retain their flavor, freshness, aroma and color so long, as they do not come into contact with moisture. Hence moisture proof and air tight spices packaging is essential requirements to ensure the best garden quality of spices till they reach at the end retail point that is at the kitchen of the consumers. 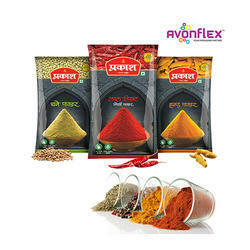 Avonflex develops superior quality spices packaging materials, which successfully resist moisture, dust and other contaminating items. Our four side sealed & Centre Sealed small packs are made from highest quality of food grade plastics, which do not react with the ingredients of these products. 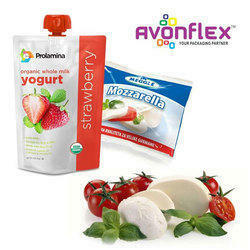 Our glossy and colorful tantalizing packaging manifolds the appeal of the product and brand value simultaneously. Packaging material is made up of multiple layer of film which provides highest barrier property. Ghee and Cooking oil need special type of durable and leak proof packaging, as they are semi-liquid in nature. Excellent quality ghee and oil packaging products help not only in preventing the leakage but also keep the products fresh and free from bacteria & germs for long length of time. Package should be highly puncture resistance and package should contain the properties of ghee such as aroma, freshness, purity. 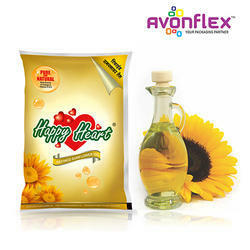 Understanding the demands of liquid packaging, Avonflex provides ghee packaging and oil packaging of unrivalled quality. Our airtight packaging products come in standout pouches, which prevent oxidation and moisture to maintain the flavour, aroma, freshness and purity of ghee and oil for long duration. High seal strength, optimum shelf life and superb print-ability are the main characteristics of our exclusively designed ghee and oil packaging products. Cooking Oil & Ghee packaging pouches are available in various design, shapes, sizes, colours and it is acclaimed for light weight and accurate dimensions. Atta & Flour is a healthy necessity in every diet and it is added to various meals. Atta & Flour packaging material should not only be hygienically processed but it should also be capable to retain the color, aroma, taste and edible qualities of flour for long period. Atta & Flour packaging material manufactured by Avonflex keeps it free from dust, dirt and dampness. Developed from food grade materials, using advanced packaging machineries, these air tight flour packaging products assure that not an iota of flavour and freshness is lost over long time of storage. These packaging products are made available by us in large volume for carrying high weight with complete comfort. Further, customized designing with superb printing impart them exquisite look, which helps the clients in brand building exercise. Pulses and cereals is a healthy necessity in every diet and it is added to various meals. It should be packaged with some high quality and reliable packaging solutions as it can retain the color, texture, aroma, taste and nutrition values of these edible items for long time period. Pulses and cereals are mostly packaged in plastic pouches as plastic pouches are easy to carry, print friendly, occupies lesser space in retail counters, and excellently moisture protected. 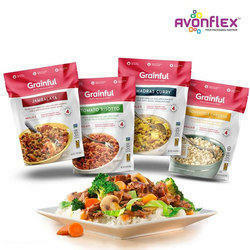 Avonflex offers top quality Pulses and Cereal packaging products, which come in captivating rolls and pouches and can be custom designed in various sizes and volumes as per the requirements of our clients. These packaging materials are laminated by us to protect the items from water vapor & aroma loss and keep their attributes in original state. Printed with highly beautiful and funky designs, these packaging products provide great convenience at the shelf of stores. Packaging is the most important aspect for sea food industry, as this type of food is prone to perish rapidly without proper packaging. Sea food packaging is also helpful in preserving the taste, aroma, freshness & nutrition values of these food products, until they are opened. Packaging is the most important aspect for frozen food industry, as this type of food is prone to perish rapidly without proper packaging. Frozen food packaging is also helpful in preserving the taste, aroma, texture, freshness & nutrition values of these food products, until they are opened. Avonflex offers frozen food packaging, which are developed from ace quality food grade packing materials and are well suitable for packing raw, semi-cooked as well as cooked food. Our quality management system manages the cold chain to provide these packaging materials tolerance of minus degree temperature for avoiding the degradation of food products even in extreme conditions. Avonflex’s advanced frozen food packaging designs help consumers enjoy their favourite foods out of season while reducing waste and increasing long-lasting freshness. Our wide range of material options allow you to create unique frozen food bags that satisfy your brand’s needs with eye-catching design capabilities. Sugar is world’s one of the most consumed products as it is used in many households. Now-a-days sugar is packaged in paper or plastic packages. Sugar draws moisture from the air and could spoil if it absorbs too much, hence the proper sugar packaging is required. 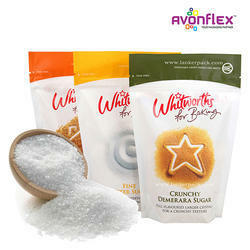 Avonflex provides sugar packaging bags which are made from good quality and hygienic materials. Our sugar packages protect the sugar from any kind of contamination, odor, ants, oxygen and moisture and always ensure that the sugar can stay pristine and sweet. We offer both printed and unprinted sugar bags to suit your purposes. Our sugar bags are puncture resistant and durable for safe transportation and long shelf life. We produce sugar pouches in various size options, catering for diverse preferences and are known for its properties like moisture proof, durability, excellent surface finish and our packages is also considered as light weighted. Versatile and effective pan masala and tobacco packaging has become a preferred choice amongst different industries. Plastic films used at Avonflex in the production of these tobacco packaging’s are used to improve the flexibility and durability of packaging material. 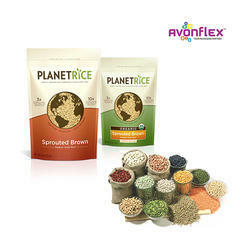 Avonflex offers a versatile collection of tobacco packages. Packing materials offered by us are manufactured by utilizing superior quality raw materials and latest technologies and they are known for their tear resistance, moisture resistance, strength and durability. Tobacco packing materials are suitable to meet the specifications of diverse tobacco industries and they are available in varied range of colours, sizes and styles. Mouth Fresheners, commonly known as Mukhwas in India, are extensive preparations of various Indian herbs to suit the taste platter. These mouth fresheners are consumed widely as they are a preferred necessity post meals. At Avonflex with the help of our adroit professionals, we are engaged in offering a high grade range of Mouth Freshener Packaging which are eco-friendly, free from toxic, biodegradable and waterproof . The offered packaging is designed and printed by our skilled professionals using quality raw-material with the help of cutting-edge machinery. This wrapper is used for packaging of the mouth freshener in food sectors. It is made available in wide range of sizes, colors and finishes according to requirements of the clients. Our clients can avail this Mouth Freshener Packaging from us at the most affordable rates. Rice is a moist-sensitive product and needs the correct packaging to ensure that the products are preserved and protected. The most commonly searched for feature of rice packaging include, a packaging that can withstand various weight capacities and one which would be moisture resistant. Oats is a form of wheat that is used to produce cereals and needs to be protected from excess air and moist, hence the perfect oats packaging is needed. Different oats brands have evolved over time thus making it harder to distinguish the difference amongst brands. The only way a brand can really distinguish itself would be through an effective packaging design. 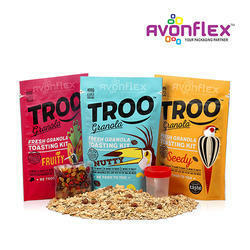 At Avonflex various plastic forms are included in the manufacturing of flexible packaging which improves the flexibility and durability of oats packaging. 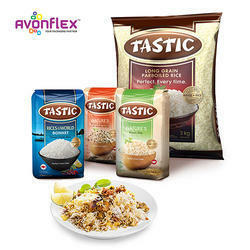 Oats packaging bags are made up of multiple layers which protect the product from various hazards. Packing materials offered by us are manufactured by utilizing finest quality raw materials and latest technologies and they are known for their tear resistance, moisture resistance, strength and durability. The option of having your oats packaging de metalized for easy product viewing is made available other modifications made to bags include the use of a Euro-Hook. Oats packaging can be produced in the form of various bags options such as; flat bottom bags, gusset bags, stand up pouches, pillow pouches, cold seal roll and spout pouches. • We supply in Roll form as per FFS Machine Requirement like Multi Track Job Single Track Job. • Can be supplied in diverse style of customized Pouch form. 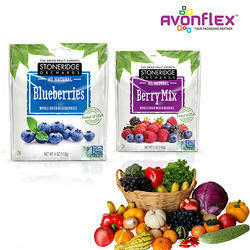 Pet food packaging should be able to preserve produce, and have to be durable enough to contain the weight of pet food. 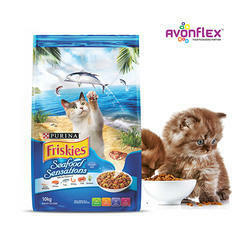 Various size pet food packaging should be provided to cater for the vast variety. The pet food packaging is used as a promotional tool therefore careful consideration should be done when choosing the right packaging design which will in turn lure consumers to your product. 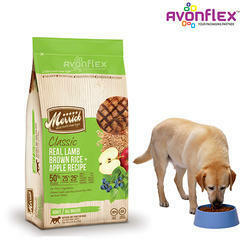 Avonflex offers a versatile collection of PET food Packaging solutions. This package is made up of various layers of materials to ensure maximum safety. Packing materials offered by us are manufactured by utilizing finest quality raw materials and latest technologies and they are known for their tear resistance, moisture resistance, strength and durability. Avonflex manufactures PET food packing materials which are suitable to meet the specifications of diverse PET food manufacturing industries. Dry Fruits packaging should be air tight and moisture protected so that the products can withstand the hassle of transportation and remain unbroken and undamaged till it reaches to the consumer point. All the Dry Fruits packaging solutions offered by Avonflex are excellently attractive, and climate resistant for offering excellent shelf life of these sensitive and costly edible products. 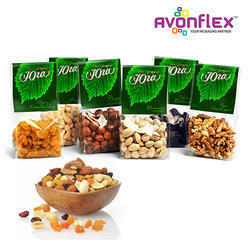 For effective and cost efficient dry fruit packaging, Avonflex offers best quality and toxin free Stand up & Zipper Pouches and many other Pouches as per customers requirement. Packing materials offered by us are manufactured by utilizing finest quality raw materials and latest technologies and they are known for their tamper proof, leakage proof, easy opening and closing, tear resistance, moisture resistance, strength and durability. We manufacture Dry fruits packing material which are suitable to meet the specifications of diverse dry fruit manufacturing industries. Organic food is best served when the acidic, basic and other properties are maintained till it is consumed by end customer. When it comes to packaging for organic food products, additional concerns must be taken care. Safety for human consumption and environment protection are the most important criteria when choosing organic food packaging. In marketing organic products, what differentiates them from nonorganic options needs to be conveyed to the potential buyer. Keeping this in mind, Avonflex offers Packaging that fulfils the legal and quality requirement for organic foods and products are expected to reach the consumers in same condition when packed. 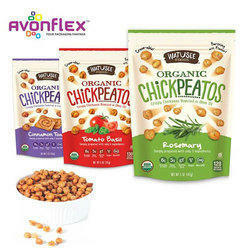 Avonflex offers a versatile collection of packages which holds all the properties of Organic Food. Our mission is to help raise brand awareness of natural food products through first-class packaging that entices customers to stop and look. Our creative engineers design aesthetically pleasing packaging that communicates both visually and tangibly. Plus, our flexible, space-saving designs have lower carbon footprints than traditional boxed items, making them an eco-friendly choice that perfectly aligns with many of the values of organic food producers. Noodles are an important category of ready to cook food. Noodles have extended shelf-life and are available off the market shelves. Herbs, spices and veggies chunks present in noodles taste-maker are the reasons for their distinguish taste and aroma and they require high barrier from moisture, light, air and microbes so that they effectively do magic with taste. Noodles require being intact till it reaches customers kitchen. So Avonflex makes the package attractive, climate resistant and also make sure that the content of the product is preserved till it is opened. We offer excellent barrier structures for noodles to extend the product shelf life. Packing materials offered by us are manufactured by utilizing finest quality raw materials and latest technologies and they are known for their tear resistance, moisture resistance, strength and durability. Not only will your products be protected but our printing capabilities can enhance the package and deliver on whatever package designs you want whether it is with high definition rotogravure printing or matte/gloss finishes. Ready to eat packages have a great market share and packaging solution has to the best for this purpose. To survive in this throat cut business, having the appropriate instant food packaging is of great importance as product safety and visual appeal of the product are paramount. Dairy Products are perishable products and need regular quality check and protection from light, microbes, moisture, heat, oxidation and other deteriorative agents. Taste and nutritional value of dairy products are very sensitive parameter, dairy products have ability to grasp foreign odour and also very much susceptible to oxidative rancidity and microorganism growth. Dairy products are sensitive to heat temperatures and mostly it has to be refrigerated during transport and storage. Avonflex offers packaging materials which have oxygen, moisture and seal properties essential for offering excellent product protection, which looks attractive, at the same time offers excellent durability at affordable pricing. We have come up with wide range of films, bags, laminates and equipment for packaging bulk dairy products, as well as, consumer portioned items, by considering such factors like protecting the flavors and textures throughout display and distribution. The packaging materials are manufactured by utilizing finest quality raw materials and latest technologies and they are known for their tear resistance, moisture resistance, strength and durability. Milk is a daily consumable product and it is used by millions of consumers daily. 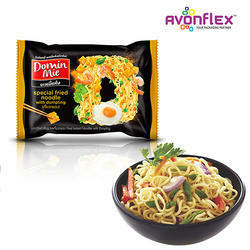 So Avonflex makes the package that is reliable and safe for the consumers. Packing materials offered by us are manufactured by utilizing finest quality raw materials and latest technologies and they are known for their tear resistance, moisture resistance, strength and durability. We create the package considering the product properties and also makes sure it is safe. Our pouch films are available in clear and opaque film options with the ability to print up to eight color artwork directly on the pouch.